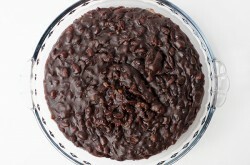 The azuki bean (赤红豆, Chi Hong Dou) is one of the most important ingredients for making Chinese desserts. It is commonly used in Mainland-style hot pastries and Cantonese and Taiwanese cold desserts. There are red bean popsicles, shaved ice with red bean sauce, fried dough with red bean paste filling, red beans with coconut milk, red bean pancakes etc. 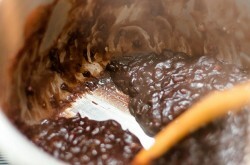 To make those yummy desserts, you will need red bean paste. 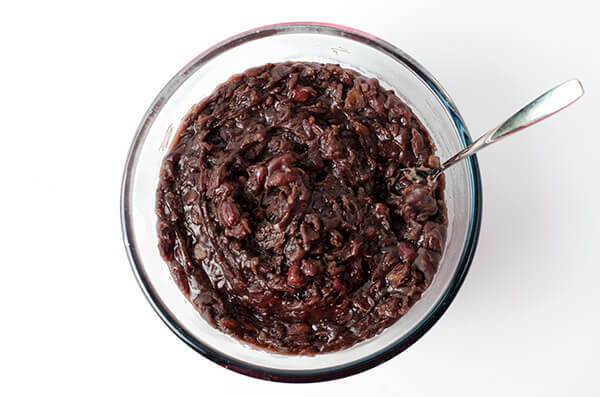 This sweet and gooey red bean paste is so delicious that you can even eat it by itself. 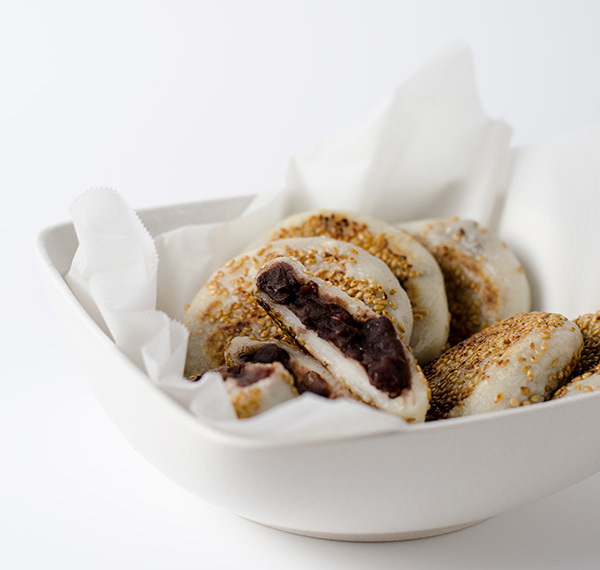 There are mainly two types of red bean paste in Chinese cuisine – mashed and smooth. The key difference is whether it contains the bean husk or not. The mashed red bean paste is the most common for home cooking and is the one I include in the recipe below. 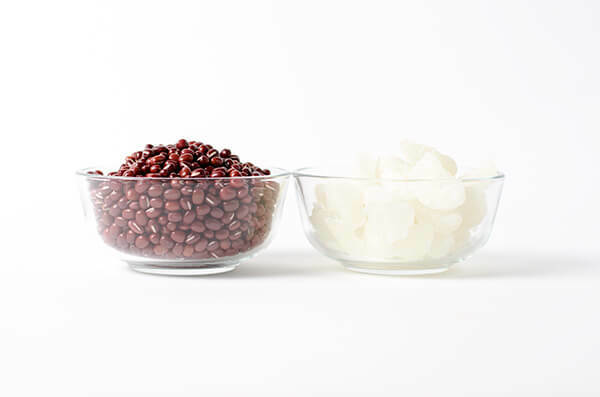 You only need to boil the azuki beans with sugar until very soft, then smash them to the texture you prefer. The finished paste will have a consistent thick texture that is easy to shape, and contains some whole and broken beans. The smooth red bean paste is a bit of a hassle to make and normally can just be purchased from a Chinese or Japanese market. 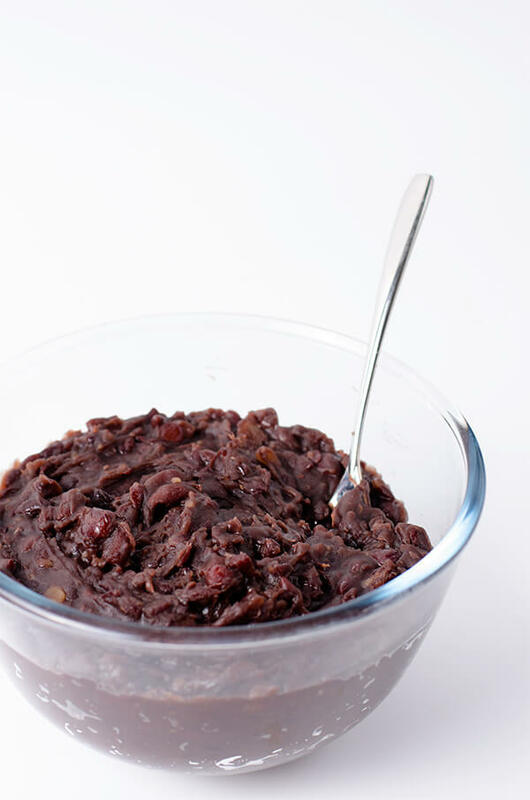 For smooth paste, the azuki beans are boiled and mashed without adding sugar. 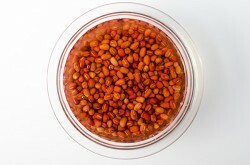 The mashed beans are diluted into a slurry, then strained to remove the husk. 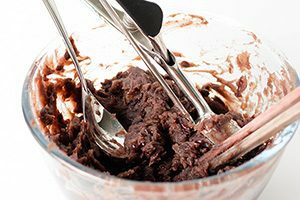 To make the texture of bean paste smooth and gooey, a substantial amount of sugar and lard (or vegetable oil) will be blended into the paste. This is the reason you find that supermarket red bean paste has a better mouthfeel than the homemade kind. If you cannot easily find pre-made red bean paste your local Asian market, I highly recommend you to make it at home. 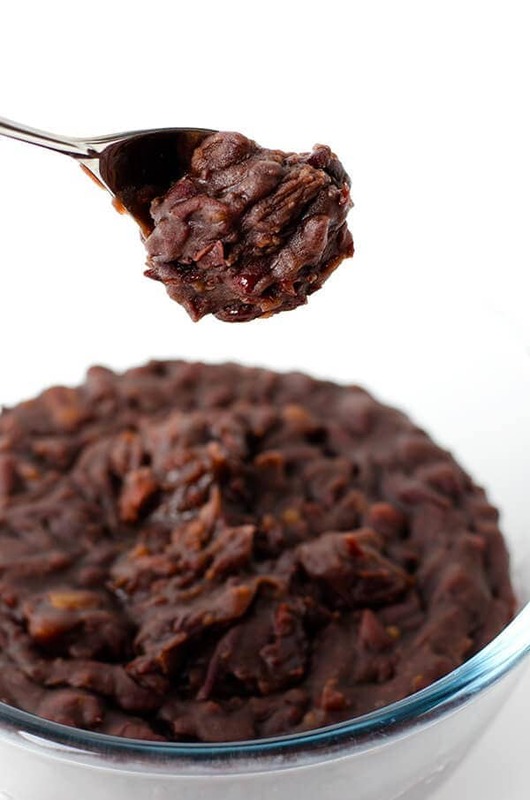 It is much healthier this way, and you can adjust the amount of sugar to your taste, and you can select high quality azuki beans to make the paste taste great. One more word about the sugar in this recipe. If you are not sure about the sweetness, you can divide and add the sugar in two to three batches. To serve the red bean paste directly, or if the red bean paste is the main ingredient in the dessert, you should use 200 grams (7 ounces) of sugar. This way, the red bean paste will taste just right by itself. However, if you want to use the paste as a pastry filling, you should make the paste sweeter by following the recipe below, so the finished bread or cake will taste just right. This recipe introduces 2 ways to make the bean paste – with and without a pressure cooker. I really like using the pressure cooker to prep beans. 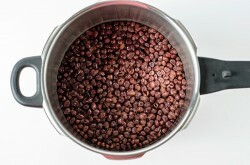 It does not require pre-soaking the beans overnight, and it reduces the cooking time by more than two thirds. But if you don’t own a pressure cooker, no worries! You can still use a normal pot to cook this one easily. I have created a short video below to walk you through the cooking process. If you are new to Chinese cooking, don’t forget to check out my YouTube channel. 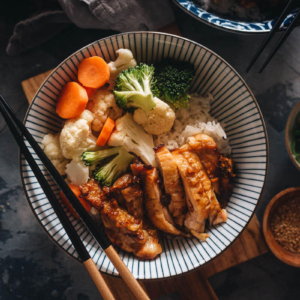 I have a collection of cooking videos that is focused on Chinese cuisine, which will help to get familiar with preparing Chinese dishes in a very short time. Come back Thursday to check out (updated on 25th Sept. 2014) To use red bean paste, you could check out the sticky rice cake with red bean paste recipe. It’s super yummy, healthy, and gluten-free! 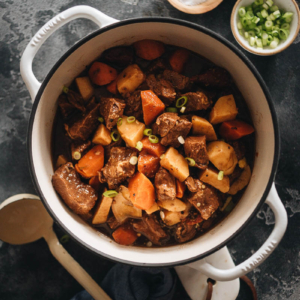 Subscribe to our weekly newsletter now so you won’t miss a recipe! For an extra bonus, you will get a free e-book that contains the 25 top recipes from Omnivore’s Cookbook. We only send out one email per week and we promise not to spam your inbox. 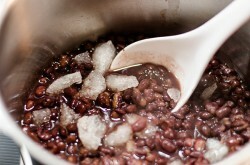 Combine red beans and 3 cups of water in pressure cooker. Lock the lid and heat over medium high heat until rated pressure has been reached. Turn to lowest heat and cook at high pressure for 20 minutes. Turn off heat and allow the pressure release naturally. Remove the lid and stir the beans several times. Add rock sugar and turn back to medium high heat. Stir the beans constantly with a spatula and boil until the mixture has thickened. When you draw a line in the mixture with a spatula and can see the bottom of the pot for 1 or 2 seconds, the beans are finished. Remove from heat and transfer to a large bowl. 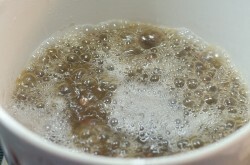 The red bean “soup” is, at this point, still a thick liquid and not quite as thick as a paste. It will thicken quickly after cooking down, and transform into a paste after it has been chilled. The paste will last about a week in an airtight container in the fridge, or about a month in the freezer. 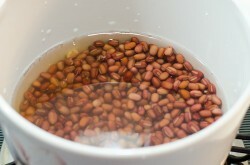 Rinse azuki beans and pre-soak them in room temperature water overnight. Discard the soaking water. 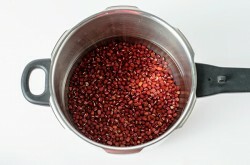 Combine beans and 4 cups water in a large pot. Bring the water to a boil, then turn to lowest heat. Simmer, covered, for about 1 hour, until beans are soft and can be easily mashed with a spatula. Throughout the simmering, check the water level and make sure the water still covers the beans, so they won’t be burnt on the bottom. Add water in small amounts, if necessary. Stir beans gently (without mashing them), occasionally during simmering. Follow steps 2 and 3 above to complete the paste. 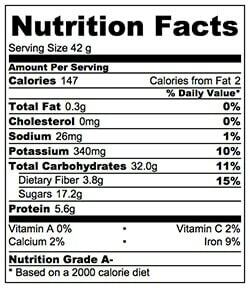 The nutrition facts are calculated based on 1 of the 12 servings generated from this recipe. 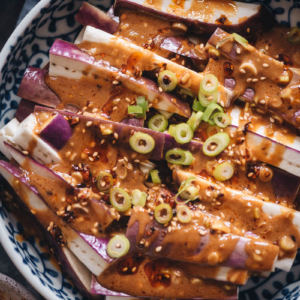 It’s recipes like these (among many others) that make your blog so unique and valuable! You post these amazing, interesting recipes that I never knew I needed to know about. You’ve opened up my cooking ability to a whole new chapter of ideas! Awesome recipe, great tutorial! Thanks for your recipe, it’s easy to follow and very helpful. 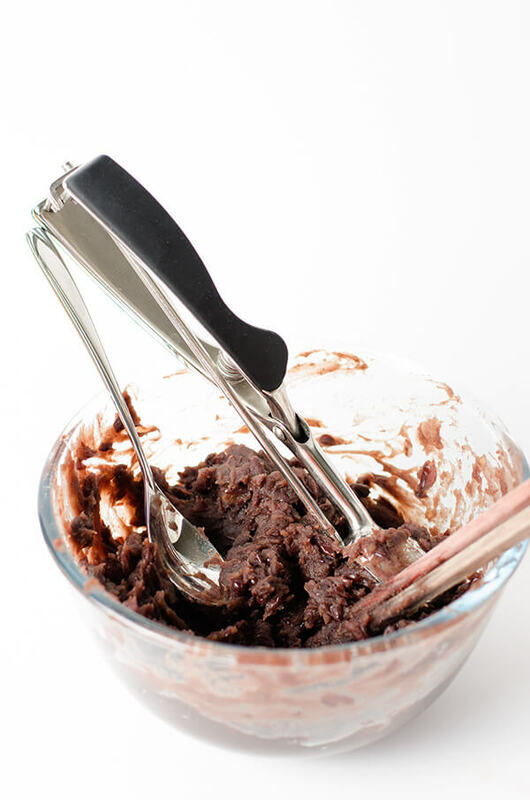 I wanted to make red bean paste at home and this makes it very easy. Thank you for the recipe. Can’t wait to try it! Do you use fresh beans or the dried ones? Very insightful. Will it be okay if no sugar is added? Hi Jason, it’s ok without adding sugar, but I think you need to add some spices to season the bean paste, depend on how you will use them. Sorry, I’m still learning, but what do mean by seasoning? And what spices do you suggest? Hi Jason, sorry I didn’t explain very clear earlier. I always add sugar into the red bean paste, because I use it to make Chinese style dessert or buns. Even I serve the red bean paste by itself, I will add some sugar (about 2/3 or 1/2 of the amount that is called in the recipe), so it will be delicious but not too sweet. 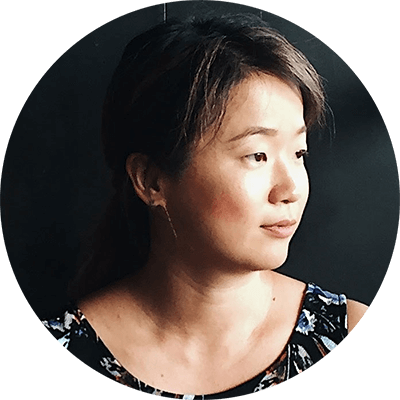 When you asked the first question, I assumed you want to use it in cooking other cuisine and already have some ideas in mind. However, if you never cooked this before and don’t want to consume too much sugar, I suggest you to add a small amount of sugar during cooking and taste it. Then you could adjust the flavor by adding more sugar. If you don’t add any sugar at all, it will just taste like beans. Thanks for the tip. I have made this twice before reading your recipe and always end up having dry crumbling paste that doesn’t hold together because I always drain the “soup” completely after the beans are soft. could this be my mistake? Do the beans naturally keep absorbing moisture? I don’t think draining the soup is a good idea. I never dry it. After the beans are softened, you could boil with medium or medium high heat without cover, to thicken the paste. Just be careful, you should look closely and stir the paste constantly when the it starts to thicken. When the paste is still runny, but starts to stick to the bottom and can coat a spoon (you could see how’s the texture looks like in the video in this post), you should stop cooking. The paste will form and become very thick when it’s cooled down. It should hold together no matter you add sugar or not. nice clear readable fun.Wanted to make red bean paste also. Also when on SCD to heal digestion, no sugar was allowed, so in the habit of not buying sugar. Used honey or fruit. Maybe cherries would be good or persimmons. Wonder what people did before sugar at stores? Or could make it savory with garlic, seasoned with herbs like hummus or …. Sorry , my brain is coming up with possibilities. Thanks for the tip again. does this work with mung beans too? I want to make Bread Bun with red bean paste filling. I want to sell this also. My Bun is make with preservative. But red bean paste is without preservative. So I want to know, how long can this red bean paste good (not damage) ? Can preservative be added in this red bean paste ? If can, which amount of preservative add in this paste ? Thank u.
I really love your recipes and how you explain directions so simply. Just wondered, do you have to soak the beans for so long? Love your recipes, thank you for taking the time to have a blog as good recipes are hard to find online measured in grams when I’m from the UK! I want to make moon cake and was wondering if this red bean paste would be suitable for the filling? Hi Leta, it depends on the type of mooncake you’re making. If you’re making Cantonese mooncakes, the type that requires you to rest them for a few days before serving, then this is not the right recipe. Cantonese mooncake requires lard (or type of fat) in the filling, so the oil will seep out after resting and makes the dough shiny and tender. I have a post here that explains the process: https://omnivorescookbook.com/traditional-mooncake However if your recipe does not require this process, then you can use this recipe as filling directly. Hi Maggie, tq for your lovely recipes, would love to know how to make the thicken red beans finer and smoother for buns and mooncake fillings as well as for mochis also, thank you..
Hi Aish, one thing you can try: once you finish mashing the cooked beans, place them on a fine mesh strainer and press them through with the back of a spoon. It will separate the shells and make the paste finer. I am making a match a cake with this paste in the middle and this recipe is so helpful; thank you so much!! I love “weird” dishes or anything exotic that sounds yummy. Don’t ever hesitate to post things like this! I’m currently on the summer for one hour stage and so excited!!! Did I miss something? I see salt in the ingredients list…but no mention of it during the steps to make red bean paste. When should it be added?